May 25 2012 Friday We left Signal Mountain Lodge this morning and headed north to Yellowstone. Since the weather was snowy and unpredictable, we went west over Teton Pass and north through Idaho and into West Yellowstone. We spotted some bison, but it was difficult to get clear pictures. The roads were dry, then wet with rainy conditions, then wet snowy conditions and finally just plain snowy. It was a dreary, gray day, but we did not have any problems with road conditions. As we came out of West Yellowstone and followed the Madison River, the weather cleared for abrief moment and I was able to get a nice picture of a bison with the river in the background. We travelled through the Lamar Valley and into Silver Gate. As we approached Silver Gate, Lance spotted two moose along a creek. We parked and walked down to the area and got some nice shots of the moose eating the willows along the creek bank. As we watched, the mother and adolescent moose decided to cross the creek. That was definitely the highlight of the day. Our home for the next week is the Elkhorn Lodge. We had stayed here before and enjoy the hosts and the lodge. May 26 2012 Saturday This morning we woke up to three inches of snow outside. We cleaned off the car, loaded up our gear and took off for Lamar Valley. In the morning it was snowy and beautiful in the Lamar Valley of Yellowstone. There are over 3500 bison in Yellowstone Park. Today many of them were gathered in the valley amidst the snowy landscape. As we continued through the valley, we pulled over several times to use the binoculars and look around. At one of the pullouts, we spotted some movement on a far hill…wolves! There were two black/brown wolves stalking 4 elk on a hill. The wolves would watch and then move a little closer and we thought we would see some action. However, after awhile, the elk and wolves went their separate ways. The Yellowstone River Picnic area is well known for its resident bighorn sheep. Sure enough, there were all bedded down in the snow snoozing through the morning. As the day progressed the sun came out and the temperature went up to 60 degrees. Yippee!! In the spring, along with the massive herds of bison, the baby bison (red dogs) are in evidence everywhere. I wondered what the ratio is of bison lost over the winter to red dogs born in the spring. I’m told that each year the bison herds grow a little, so I guess that the bison births outweigh those lost over the winter. At last in the late afternoon we had two bear sighting within one mile. We were travelling from Tower to Mammoth Hot Springs and we saw the cars lined up on the road. This is always a sign of a bear jam. The rangers did their best to keep the cars moving along and the tourists 100 yards away from the bear. For as much as we wondered if we would even be able to go into the park today due to the weather, it turned out to be a great day. We finished the day at the Stop the Car Trading Post. This is one of our favorite places in Silver Gate. They have homemade muffins, breads, soups, and Lances favorite…huckleberry floats! May 27 2012 Sunday Repeat of yesterday, only this morning’s snow total was six inches. The weather towards the park looked gray and dreary and also very pretty with all the snow on the trees. Just after we passed through the Northeast Entrance to Yellowstone Park, we saw a moose and stopped for photos. This area has been a great location for us to see moose. Every day we see at least one. I just never get tired of seeing the bison. They are everywhere. 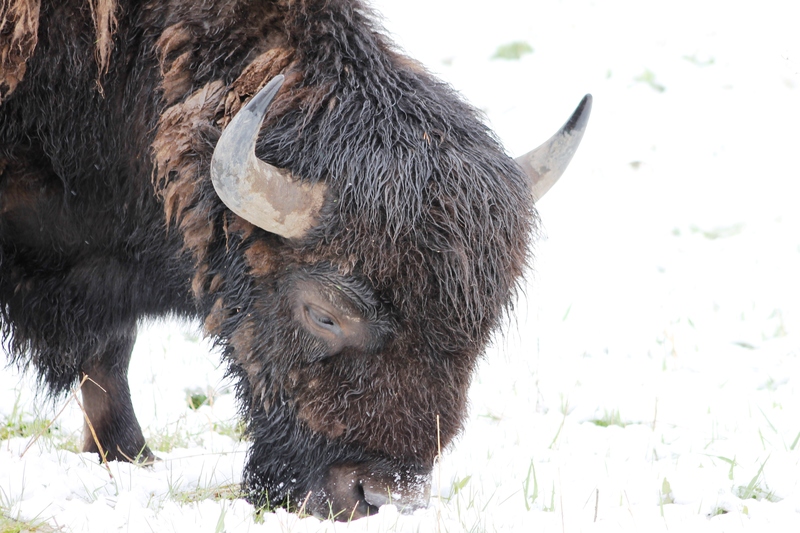 Today in the snow the bison had to move their head back and forth to clear the snow so that they could eat the grass beneath the snow. As we drove through the Lamar Valley, it was quiet this morning in the 35 degree temperature. Some of the roads in the Park were closed for awhile this morning so that the roads could be plowed and made safe for all the travellers. As we approached Mammoth Hot Springs, we saw a herd of female elk grazing. Oddly, Mammoth Resort area was without power, and there were no bathrooms available, no restaurant service and no operational service stations. Luckily, we did not need any services. As we came back to the Tower area, a coyote was searching for food in the snow. After awhile he sniffed out what he was looking for, and dove under the snow to get dinner. We noticed a ranger car turn into the Petrified Tree area, so naturally we followed to see what this was all about. Of course, it was a black bear! He was in a difficult area for any cars to stop and the ranger did his job and kept everyone safely away. I managed to get a picture as the bear was scratching his backside. Our final drive for the day was up the Tower road to the Falls area. Again we spied a cinammon colored black bear. It must have been the weather, because all the bears seemed to have itchy backsides. We returned to Cooke City and had a wonderful dinner at the Beartooth Cafe. For such a small cafe, they have great food! May 28 2012 Monday Third day in a row to wake up to 4 inches of snow…and still snowing. It’s supposed to get warmer and stop snowing soon…we hope! It turned out to be a great day in the park. We saw three more black bears, long horn sheep, lots of bison, elk, two foxes, and a badger. 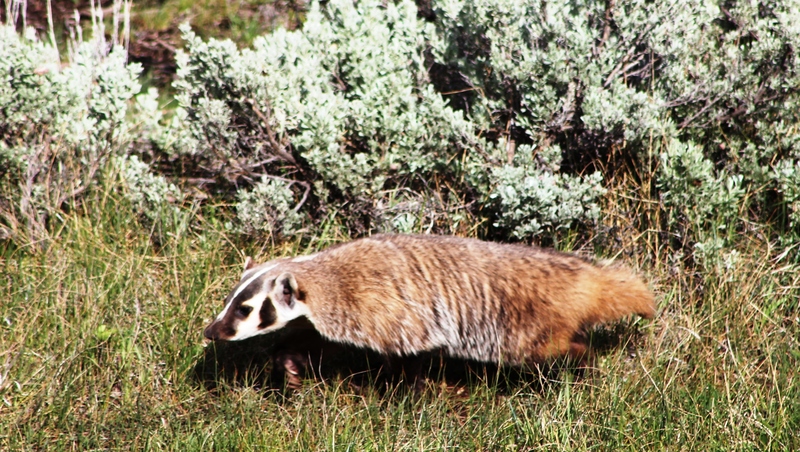 The badger was a first for us and was really fun to watch him scooting around. By mid-afternoon, the sun came out and the temperature got to the mid-fifties. Nice sweatshirt weather. At last we could see the mountains with sun on them. There are still parts of the park that are closed but we are hoping that by tomorrow all the parks roads will be open. This was our first truly gorgeous day in Yellowstone. We woke up to perfectly blue skies and the temps were in the 50’s and 60’s. Plan for the day was the hike to the suspension bridge on Hellroaring Creek. This hike gave us an opportunity to take a break from the car and travel by foot for a change. The Hellroaring Creek Trail explores the hilly region along the northern stretches of the Yellowstone River. The trail descends a series of switchbacks, dropping about 600 feet in a mile to the 220 ft. long suspension bridge over the Black Canyon of the Yellowstone River. From the parking lot, the trail descends through open fields and the occasional patch of pine forest. It isn’t long until you get a view of the creek. Hellroaring Creek from the beginning of the trail. The first mile is hiking along steep switchbacks that wind down towards the Yellowstone River, which is easily visible from the trail. We kept our eyes open, because this was bear territory. Fortunately, all we saw was beautiful scenery and lovely early wildflowers. After the switchbacks, the trail flattens out and crosses a stable suspension bridge over a gorge created by the Yellowstone. Of course, the return hike is all uphill, so I would rate the second half of the trail as somewhat strenuous hiking. After our hike we drove the upper loop since Dunraven Pass had finally opened! We ate dinner at the Beartooth Cafe in Cooke City and the grilled salmon and vegetarian lasagna were excellent! This day was all about a Momma bear and her two cubs. We drove thru Lamar Valley and drove up the road to the Tower store. At the top of the overlook was Mom and her cubs. We watched her for hours (along with hundreds of others). The cubs were just extremely entertaining. They were definitely learning their climbing skills. Both cubs would crawl around the brush and climb up and down tree stumps. At times the trees just seemed too big for the little cubs to master, but they would not give up until they tried. We especially enjoyed watching the two cubs playing on a tree stump. They played king of the mountain endlessly. It’s times like these that make us want to keep coming back to Yellowstone. 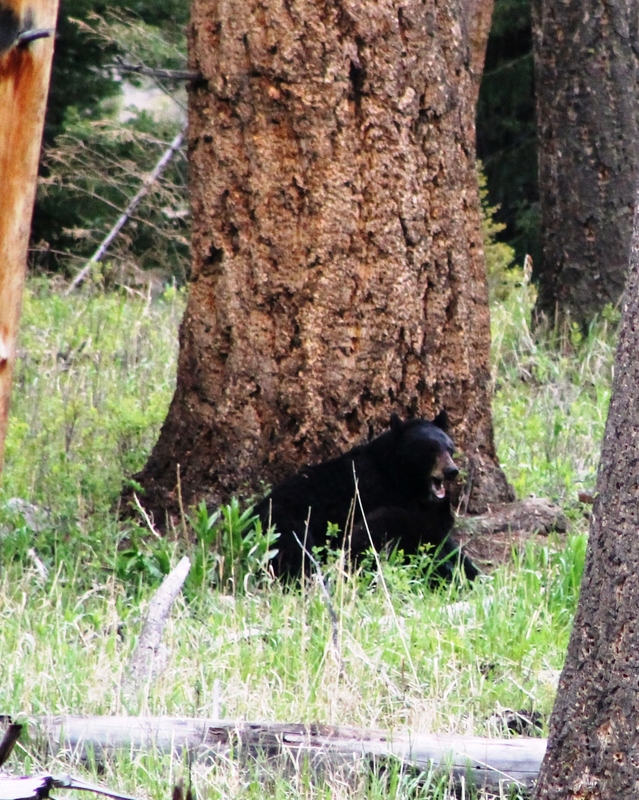 Even the professional photographers were thrilled with this delightful bear sighting. What a day! May 31 2012 Thursday Today was a beautiful day in the Park! We packed a picnic lunch and got an early start. The highlight of the day was definitely the drive over Dunraven Pass. We saw just a few cars stopped on the road. We could not go by them, so we looked around to see what was up. Up on the high ridge was a wolf! It was easily visible which is not normally the case in Yellowstone. Normally, you need good binoculars or a scope to view the wolves. As we watched another wolf joined the first. Now we were wondering what was going on. As we continued to watch the wolves, I noticed some people up the road with cameras pointed as a different area. Now I was really curious. But Wait!!! Up on the ridge a third wolf has joined the group. The area was clearly marked no parking, but the cars were stopped on the road. We normally try our best to go to the next available pullover, no matter how far away. But since we couldn’t get around the traffic in front of us, I had to get out of the car and see what was happening. Well, just about 100 yards below the wolves was a bear on a carcass!! We spent the remainder of the day driving the upper loop. An internet friend had told me about Crystal Falls in the Upper Falls Brink area. It took us a little while to find it, but it was well worth the effort. We also did the drive to Lookout Point and Inspiration Point to see Yellowstone Falls. Since it was the nicest and warmest day since we arrived, we enjoyed a late day picnic at Gibbon River.